The holidays are full of fun activities in Arizona’s Christmas City! Holiday traditions provide memories that can transcend your own existence for generations to come, whether that means hot cocoa on a cold night, driving the family around the neighborhood to gaze at the decorative lights, or going to a holiday show. This holiday season, Prescott Center for the Arts (PCA) is excited to present “A Christmas Story” at our Mainstage Theater December 6th-16th. PCA’s Executive Director, Robyn Allen, will direct this treasured classic. Robyn has led PCA, with a focus on the future, for more than two years and this production serves as her directorial debut. Not only is Robyn known for theater management, artistic production design, and youth programming education, but also for hands-on directing and acting to bring the story alive for the audience. Why do you like bringing theatre and art to our community? I think I have one of the best jobs in town as the Executive Director of PCA! But then, I think everyone must feel this way when they are doing something that they truly love and believe in. Theatre is something magical, and truly an extraordinary experience. It brings people together. Many people go to performances with groups of family members and friends. The theatre not only gets you to the same place, but it also allows you to share the experience of that particular show with one another. Much like books and movies, theatre shows allow us a temporary escape from reality. Conversely, theatre performances can even help you deal with difficulties by illustrating situations similar to the ones you’re going through. Characters are not only going through the same things you are, but also can demonstrate ways to get through it. Maybe the story presents a different perspective of the world that you did not notice before. Often, theatre performances demonstrate to us the love, the strength, the determination, etc. that we need to move forward in our lives. What is your favorite aspect of Prescott during the holiday season? Christmas has always been my favorite time of year! As a child I remember the excitement of bringing out our single strand of Christmas lights to string on the house and what a thrill it was when we plugged them in! It was the most beautiful thing I had ever seen. Driving down Whiskey Row brings me back to that moment in time when our neighborhood glowed with the spirit of Christmas. So needless to say, living in Arizona’s Christmas City is one of this gal’s dreams come true! This show also ties in well with our vision for Family Theater and our ever-growing youth programming. 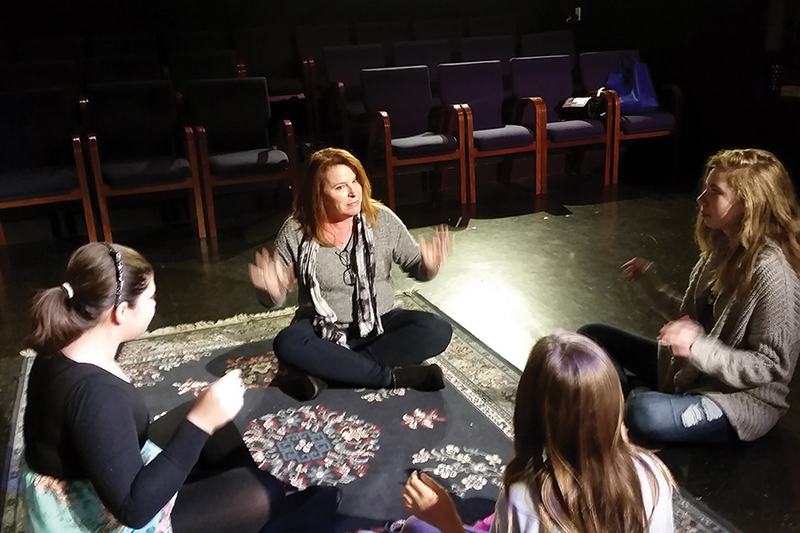 It’s a wonderful education for our young actors to work with trained adult actors. They not only help them understand basic theater techniques but also serve as mentors for our youth. Theater teaches us all so many life skills that transfer to all job opportunities; including collaboration, critical thinking, and problem solving, all of which are a large component of producing good theater. Our youth take these skills with them into the work force whether it be as an actor on Broadway or running their own small business. I have had the opportunity to watch young people with very little direction in life finally pull things into focus after their experience in youth theater. That’s what excites me the most! If you have one comment about why community theatre is beneficial, what would it be? It’s not only our youth program that can be transformative. We’ve had adults with absolutely no background in theater come audition for a play, volunteer to work on a set or backstage that say theater has filled a void and been a gift that keeps on giving! I feel so fortunate to live in a thriving arts community and to work with such talented people! And I am grateful to all of our patrons, who trust us with their entertainment dollars. With so many wonderful things to choose from during this holiday season, I humbly ask that you give “A Christmas Story” a try. You are sure to leave with a smile on your face and a skip in your step! Create a tradition of fun this season. Check out www.pca-az.net or call 928.445.3286 for additional information on purchasing tickets, community education and volunteering opportunities. And, don’t forget the PCA’s Art Gallery and Gift Shop is open to find the perfect treasured gifts for everyone in the family.